How to Use Digital Multimeter – Guide and Tutorial. Using analog or digital multimeter in PCB, Electronics or mobile phone repairing is must. How to Use Digital Multimeter – Guide and Tutorial. Using analog or digital multimeter in PCB, Electronics or mobile phone repairing is must. 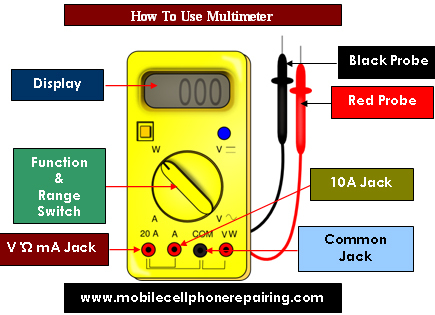 Learn how to use a digital multimeter. The meter used for checking various functions related to electric and electronics is called multi meter or Multimeter. A Multimeter can be used as volt meter, Ohm meter and ampere meter. Multimeter is a very useful instrument which can also be used for checking various electronic components like resistor, capacitor, coil, transformer, diode, transistor resistance etc. It can also be used for checking continuity, volt, ohm and ampere. Rating and reading of all functions of a Multimeter are displayed on the display screen in digital form which are more accurate and can be easily read by users. AC-DC Volt, AC-DC Current, checking of SMD components and digital gate operation (high / low, pulse) etc can be done more accurately by a digital Multimeter. Screen Area: This section of a digital Multimeter consists of a LCD screen on which digits are displayed which can be easily read users. Mechanical Area: This section of the Multimeter consists of – rotary switch, sliding switch, pin plug and various type of checking range. Rotary selector switch – Various checking ranges are selected through this switch which is indicated by arrows on the switch. Sliding switch – There are two sliding switches in a digital Multimeter – (1) PWR and (2) PK-HD PWR switch, used for switching the power supply ON or OFF. PK-HD switch is used for holding the variable ratings displayed on the screen. Pin Plug – There are 4 pin plugs in a digital Multimeter for connecting the RED and Black Probe. These pins are:- COM Plug: This is common plug. Black probe is connected with this plug while using the meter. – VW Plug: This plug is used for measuring voltage and resistance. RED probe is connected with this plug. – mA Plug: This plug is used for measuring current. Up to 400 mille ampere current can be measured by this plug. – 20A Plug: This plug is used for measuring current up to 20 ampere. RED Probe is connected with this plug for measuring current. Checking Range: Various ranges are built in a digital Multimeter for getting result of various electronic functions. – DC Volt Range: DC Volt is measured by this range of the meter. There are 5 voltage positions for this purpose – 400 mv, 4v, 40v, 400v and 1000v. – DC Current Range – DC Current is measured by this range for which there are three current positions in this area for this purpose – 400 mA, 40 mA and 20 mA. – AC Volt Range – AC Volt is measured from this range of the meter. There are 5 voltage positions in this area for this purpose – 400 mV, 4V, 40V, 400V and 750V. – AC Current Range – AC Current is measured from the range of the meter. There are 3 current positions – 400 mA, 40 mA and 20 mA. – Ohm Range – Resistance is measured from this area for which there are 7 resistance positions – 400W, 4K, 40K, 400K, 4M, 40M and 400M. – Farad Range – Capacitor is rated from this area of the multi meter. 5 sub ranges are provided in this area for this purpose – 4 nf, 40 nf, 400 nf, 4 mf and 40 mf. – Frequency Range – Frequency is rated from this area of the meter. E.g. KHz. – Logic Range – The result of digital operation is checked from this range like high, low, pulse. – Diode Range – Diode or resistance is checked from this area to know if it is working or not. I will explain how to use a digital multimeter one by one to avoid any confusion so that you can learn it easily. Connect the BLACK probe with the COMMON and RED probe with the V plug. Select the voltage position from ACV range by rotary selector switch. Select high voltage position in case you are not aware of voltage. Switch OFF the power supply of the equipment or circuit. Connect the probes with the checking points. Switch on the power of the power supply of the equipment or the circuit. Read the value on the meter screen. Fit the BLACK probe in COMMON and RED probe in VW plug. Select the voltage position by rotary selector switch. Select high voltage position in case you do not know voltage. Switch ON the power supply of the equipment or circuit the voltage of which is to be measured. Connect the meter probes with the checking points. Switch ON the power supply of the circuit and read the voltage. Fit the BLACK probe in COMMON and RED probe in MA plug. Select the current position in DCA range by rotary selector switch. Switch OFF the power supply of the circuit. Connect the probe of the meter with the circuit in series properly. Switch ON the power supply of the circuit and read the ampere on the display. Precaution: Make sure that the probe of the meter should not touch the circuit for more than 30 seconds while measuring current in the range of 20A. Fit the BLACK probe in COMMON plug and the RED probe in 20A plug. Select the current position in ACA range by rotary selector switch. Switch ON the power supply of the equipment or circuit. Connect the meter probe with the circuit in series properly and take the reading. Fit the BLACK probe in the COMMON plug and RED probe in VW plug. Select 400W position by rotary selector switch. A buzzer is also provided in 400W range. Touch the component or terminal of the wire with probe. Beep sound is known as continuity. Fit the BLACK probe in COMMON plug and RED probe in VW plug. Select KHz range by rotary selector switch. A buzzer is also provided here. Touch the point with the probe at the point where frequency is to be checked. Fit the BLACK probe in COMMON plug and the RED probe in VW plug. Select logic range by rotary selector switch. Place the BLACK probe on the ground terminal of the circuit and RED probe at the testing point. High for logic 1, low for logic 0 and for pulse reading will be displayed on the screen. Check the battery. Change if required. Check the fuse. Change if required. Which is Best Soldering Iron in India Brand and Company for Electronics Circuit Boards (PCB) Assembly and Repairing / Rework. Indian, Japanese, USA or Germany. Hot Air Blower for Mobile Phone Repairing – There are so many Hot Air Blower for Mobile Phone Repairing but which one is the best. I read your article and quite liked it. Appreciate your comprehensive explanation, I was wondering have you done any review on the analog multimeter? I found it very useful. Besides, it is brief and precise.